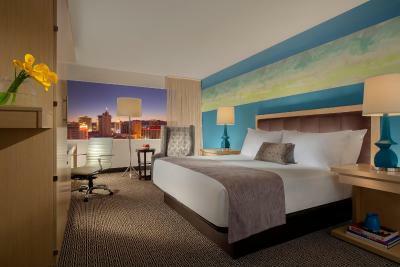 Lock in a great price for Downtown Grand, an Ascend Hotel – rated 8.3 by recent guests! Customer service was great. From the bellhop to the maid. Pretty clean and a room was not small at all. Location was very useful. 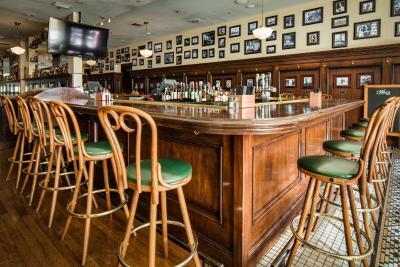 If you like downtown, and I do, it is a great location. And the frontage street it is on is 'almost' a pedestrian mall, just one lane, one way. The breakfast place (name eludes me) is almost as good as they claim! Great breakfast steak, odd potatoes... Very friendly staff, a somewhat boutique feel to the lobby. The room was very spacious with a super comfortable bed. We parked the rental and walked the area. Plenty of interest. The Mob Museum across the street is worth 2 days. Didn't go to the Strip. Everything was fabulous and when and if we come back to Vegas we will definitely consider staying there again. The room was clean and the view was nice. Staff were very polite. 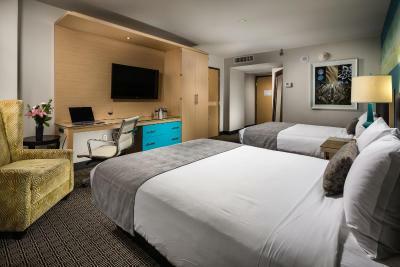 Downtown Grand, an Ascend Hotel This rating is a reflection of how the property compares to the industry standard when it comes to price, facilities and services available. It's based on a self-evaluation by the property. Use this rating to help choose your stay! 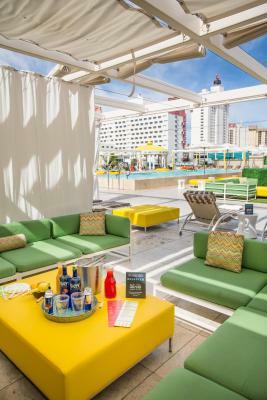 One of our top picks in Las Vegas.Located in the heart of Downtown Las Vegas, Downtown Grand, an Ascend Hotel, features the Citrus Grand Pool Deck, the largest pool deck in all of Downtown Las Vegas. This hotel and casino is 1,300 feet from Fremont Street Experience and 650 feet from the Mob Museum. 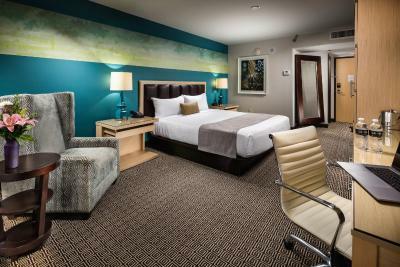 All guest rooms offer 40-inch flat-screen HDTVs, bedside tables and a build-in work desk. A hairdryer and environmentally friendly bath amenities are included in the private bathrooms. 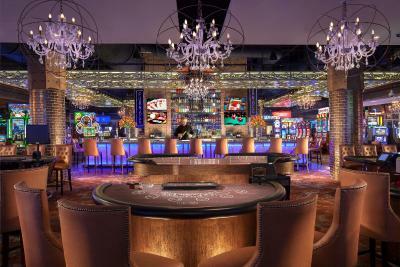 The casino at Downtown Grand, an Ascend Hotel features slot machines and table game offerings. Guests can watch games at the William Hill Sportsbook. 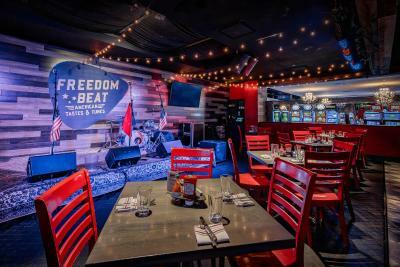 Featuring American cuisine and located on the casino floor, Freedom Beat offers live music in a state-of-the-art performance venue. 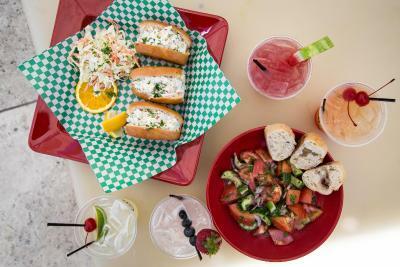 Other dining options featuring world-wide cuisine are also available on site. Guests can enjoy a workout in the on-site fitness center at Downtown Grand, an Ascend Hotel. 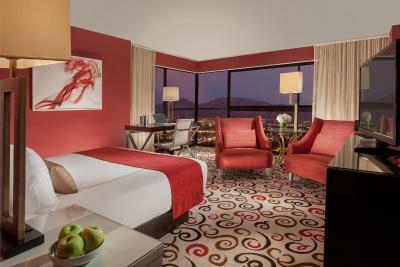 Las Vegas North Premium Outlets are located 1.9 mi away from this hotel and casino. 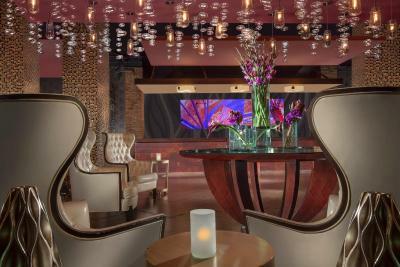 When would you like to stay at Downtown Grand, an Ascend Hotel? Offering free WiFi, this air-conditioned room includes a flat-screen HDTV, an in-room safe, ironing facilities and a private bathroom with make-up mirrors and herbal bath amenities. Offering free WiFi, this air-conditioned deluxe room includes a flat-screen TV, an in-room safe, ironing facilities and a private bathroom with make-up mirrors and herbal bath amenities. 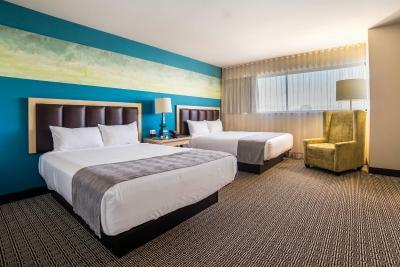 Offering free WiFi, this premium room includes a 46-inch flat-screen cable HDTV, seating area, work desk, upgraded bedding and a modern private bathroom with separate vanity area are included in this room. Bottled water is also provided. 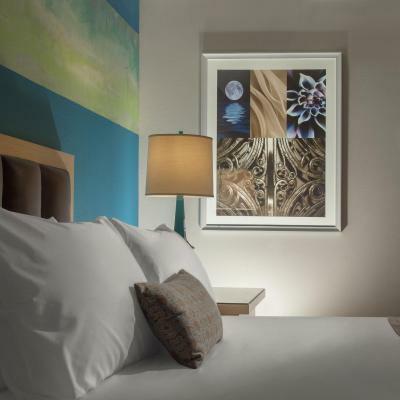 Select rooms offer city and mountain views. A 46-inch flat-screen HD cable TV, a separate seating area, work desk, upgraded bedding and 2 modern private bathrooms with separate vanity area are included in this 1-bedroom suite. Bottled water is also provided. Offering free WiFi, this deluxe room includes a flat-screen cable TV with pay-per-view channels, a work desk and a private bathroom with free toiletries. Offering free WiFi, this premium room includes a flat-screen cable TV with pay-per-view channels, a work desk and a private bathroom with free toiletries. Offering free WiFi, this spacious top-floor suite features floor-to-ceiling windows offering expansive city and mountain views. Suite features an expanded bathroom with separate vanity area and environmentally-friendly amenities. 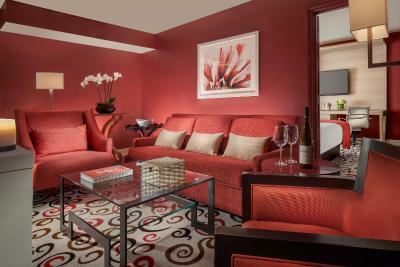 A 46-inch high-definition flat-screen TV provides a variety of entertainment options. 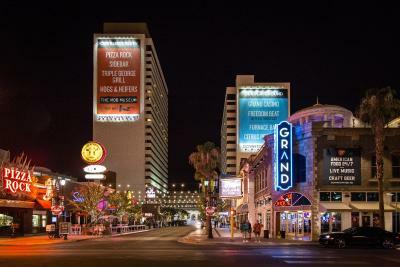 Welcome to the Downtown Grand Hotel & Casino. The party is in full swing and we’re on a roll. 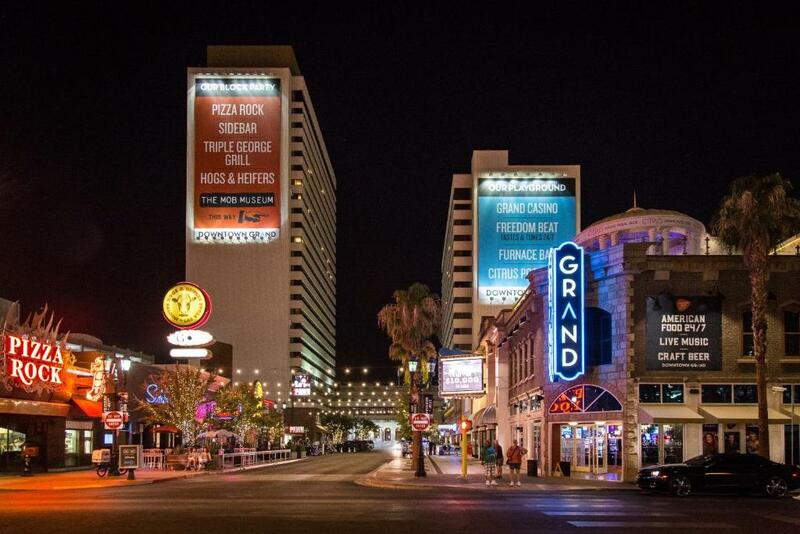 Over the past decade, Downtown Las Vegas has been experiencing a cultural shift. 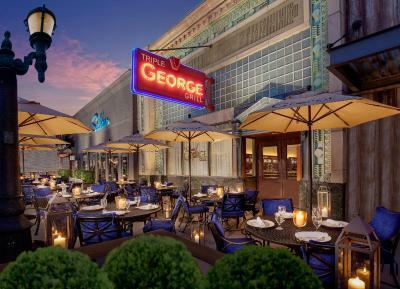 The district is attracting cutting edge corporations, music festival crowds, upscale Las Vegas locals and visitors who want experience the “real” Las Vegas. There’s only one hotel in Downtown that echoes this movement – The Downtown Grand. 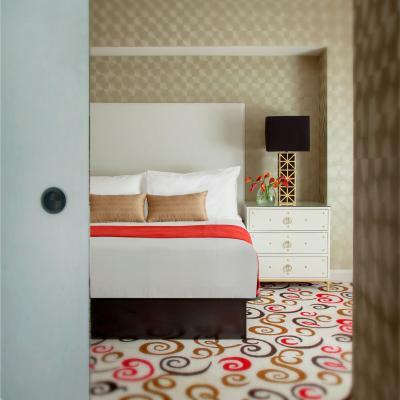 Our modern rooms and suites feel center-Strip, but the vibe and price is distinctly Downtown. 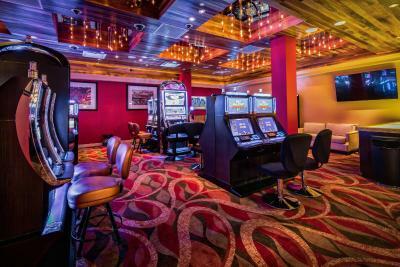 Take our award-winning industrial-chic casino for a ride. 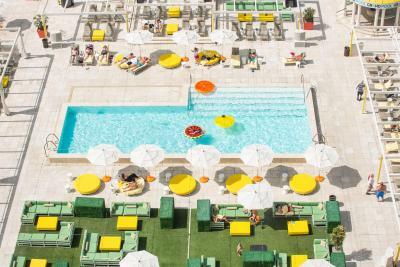 Elevate the party upstairs to the grandest pool deck, Citrus. 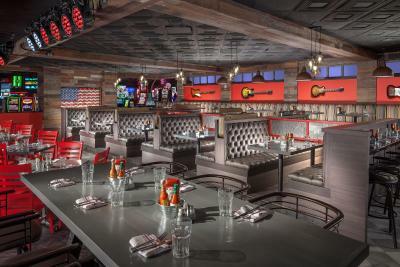 Enjoy the tastes and tunes of Americana at our restaurant Freedom Beat. 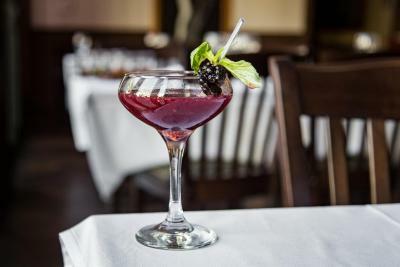 Enjoy the signature bars and restaurants along 3rd Street, or activate the entire block (we own it!). 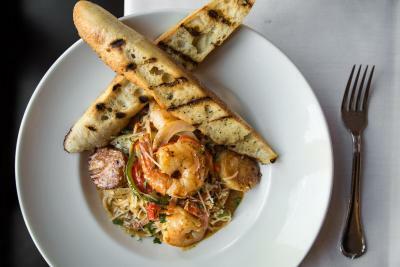 House Rules Downtown Grand, an Ascend Hotel takes special requests – add in the next step! Downtown Grand, an Ascend Hotel accepts these cards and reserves the right to temporarily hold an amount prior to arrival. Please note: For breakfast included rates, guests can enjoy Freedom Beat’s California Continental breakfast. This package includes daily breakfast per person and includes a choice of bread, pastry or house made biscuit, yogurt, globe grapes, juice and coffee. 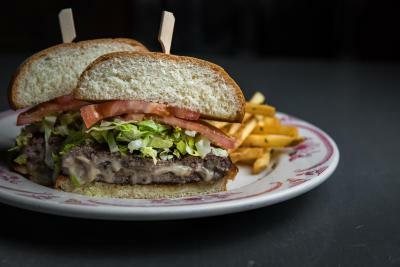 Includes taxes and 18% gratuity. If reservation has breakfast included, this is for 2 vouchers per day available at the Freedom Beat from 06:00 until 10:00. Any additional breakfast will need to be purchased. This only applies to rates that have a breakfast inclusion. 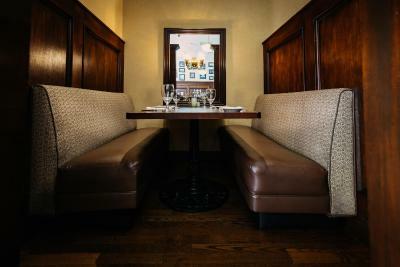 There is an additional charge for valet parking. Self parking is included as part of the resort fee. This property charges a per night refundable security deposit for incidentals and the resort fee is taxable. Smallish casino. parking is off site and wish it was casino parking only. Desk help was phenomenal. Check in was a breeze. 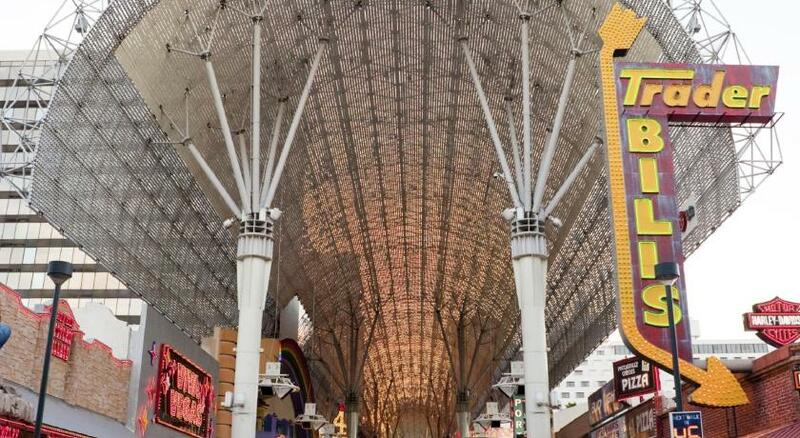 Everything, the location is awesome just in front of the Fremont street, rooms are super clean and comfortable, staff are friendly and helpful. The music from the hotel and Fremont street was so loud. It was like the band was in your room. Very noisy until 2 a.m. Staff not helpful and almost rude. A little bit noisy but considering a location, it wasn’t bad. What hurts my heart was design choices made in the renovation of the tower rooms I was assigned. The room was 1) either too big for the furnishings or 2) not enough furniture. Worse was the bathroom equipped with bottom end HD oak cabinetry, lowest end granite with no character at all. But the replacement of a tub/shower combo with a coffin-sized stall shower replete with peeling ceiling paint from inadequate ventilation - priceless. I forget how loud Fremont can be. You definitely need the ear plugs that are in the room. It was LOUD. Earplugs were provided, but it was a little over the top. A live rock band was playing until at least 1 a.m. and it was as though I was at the concert. We were on the 15th and still loud. Throw away cheap earplugs we're magic. The bathroom smell was so bad one of us puked (no alcohol involved). Dust on tables. Very bad noise from the partying outside the window until 3-4 in the morning. Nice rooms. Nice TV. Helpful and nice check-in straff.